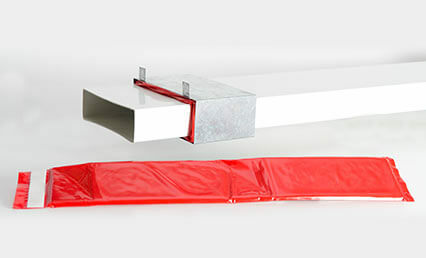 TENMAT Vent Duct Wraps are an intumescent solution providing 2 hours fire protection to rectangular PVC ventilation ducting when penetrating fire rated walls or floors. The Vent Duct Wraps are ready to install and the 4-piece design provides a quick and easy solution for solid concrete and masonry constructions. It is also suitable for installation in plasterboard partitions up to 132mm thick, when fitted within a galvanised steel outer sleeve. The intumescent material will crush and seal off the vent duct in a fire to prevent the passage of fire and hot gases. The Vent Duct Wraps are supplied in various sizes to suit all common plastic vent duct sizes. Available to suit the following Vent Duct sizes: 110x54mm, 150x70mm, 180x95mm, 204x60mm, 215x25mm, 234x29mm, 308x29mm (all 100mm wide). Please note that some web browsers may open Revit files in a new tab instead of downloading them. You can change this behaviour in your browser preference settings or by following these steps. 1. Right click on the download button or link. 2. Choose “save link as”. Although the integrity of these files is checked on creation, TENMAT accept no responsibility for any loss or damage, whether direct or consequential, caused by files which may turn out to be corrupt. Consequently it is the sole responsibility of the person downloading the file to ensure they have the appropriate IT protection measures in place.